The Stansted Short Stay car parks are the closest car parks to the terminal making them an extremely convenient choice for you parking at Stansted Airport. Stansted airport parking is rated, on average, 4 out of 5 by 1,808 Airparks customers. 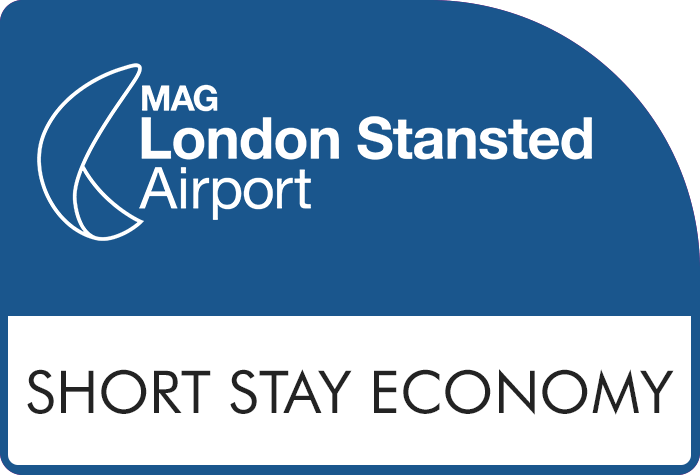 You can find the full reviews on our Stansted Short Stay reviews page. These car parks are arranged into zones all of which are within walking distance of the airport; all you need to do is park up, grab your luggage and stroll to check-in - no need to worry about transfers. You can check current availability and pricing by entering your required dates at the top of the page. When you're ready to arrange your parking at the Stansted Parking Short Stay car park you can do so using our easy online booking. You can see our full range of Stansted Airport parking here. When you arrive at a Stanstead Short Stay car park the entry barrier will read your car's registration plate, print you a ticket and automatically raise - grab your ticket and drive into the car park. Find a suitable spot for your car and remember the zone and row number, you'll keep your keys so your car will be exactly where you left it. Top Tip: If you have any trouble with the barriers press the "call" button and a member of staff will be happy to help. How do I get to Stansted Airport? Once you're parked up and ready you can just grab your luggage and stroll to the terminal building in 1-10 minutes - no need to wait for transfers, just get on with your holiday! When you get back to the UK walk back to the car park and find your car. When you get to the exit barrier use your ticket to open it and head home. If you have any trouble there is a "call" button to get a member of staff to help you. Top Tip: Don't use your debit/credit card on the barriers as you may be charged again for your parking. The Stansted Short Stay car parks take security very seriously and the staff will do everything they can to make sure your car is safe while you're away. Below you can find the security features at the car park. There are parking bays for Blue Badge holders in the Short Stay car parks with help points located close by, these operate on a first come, first served basis.